Hayden & Harper approached us as they were starting up. The managing director was very clear about what he wanted from a corporate identity, he knew his market, and most importantly knew his customers. 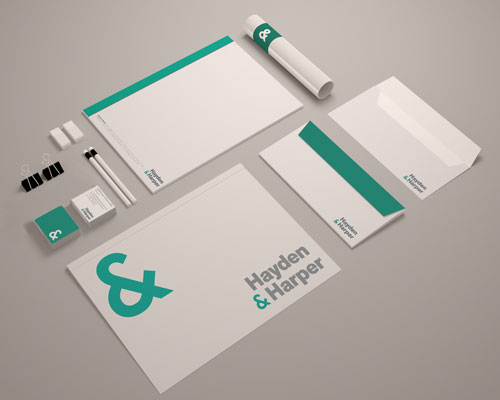 After our initial meeting it became clear that he wanted an identity class, so that their often affluent customers could easily put their trust in the Hayden & Harper brand. By far the most enjoyable item we were asked to design was the RightMove advert. 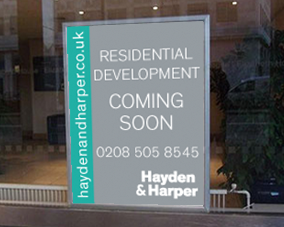 Hayden & Harper, were targeting wealthy areas surrounding their office, of which featured on the London Underground. 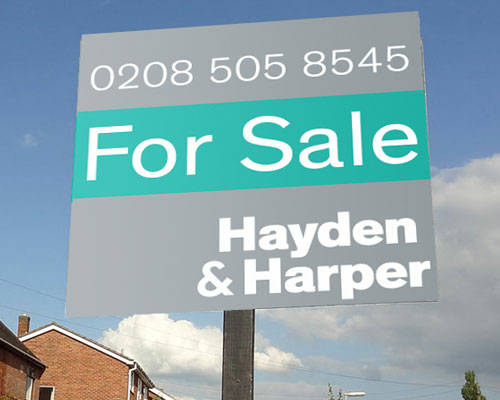 We created some adverts based on the London Underground sign, and were able to manipulate the sign so that it matched the Hayden & Harper colours. Director, Gareth says... "We had sit down conversations with a few other designers, none that could quite understand our vision, But Square Balloon, and Eoin Just seemed to understand and relate to exactly what was required. There were a number of things that impressed me about the way Square Balloon worked. The first is their customer service. They always pick up the phone, are easy to talk to, and nothing seemed like too much trouble. At each stage they provided a number of mocks that we could choose from, and were happy to make revisions until we were completely satisfied. We were really happy with the end result, you could clearly see that Square Balloon had taken our logo, and created a clear, consistent, theme running through all of the designs, which really strengthened our brand and brought it all together. The team at Square Balloon often went above and beyond, giving helpful advice where needed, and helping us understand the things that we had never dealt with before. I’d be happy to recommend Square Balloon to others in the future." 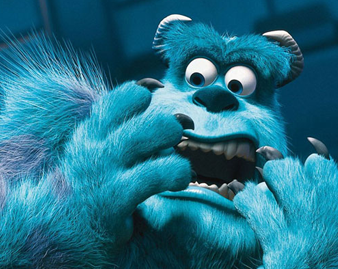 A Direct Mail piece for Disney's Monsters, Inc. We also produced Direct Mail packs for many other Disney title's including Pirates of the Caribbean, The Lion King, A Bug's Life and Pocahontas to name but a few. While we were able to extend and redraw background imagery as required for these Disney masters we also had to adhere to some of the strictest guidelines we have ever had to follow, but this gave us the opportunity to work up close with some of the original illustrations and the chance to see the preparation and fine detail that goes into each and every frame, fantastic! 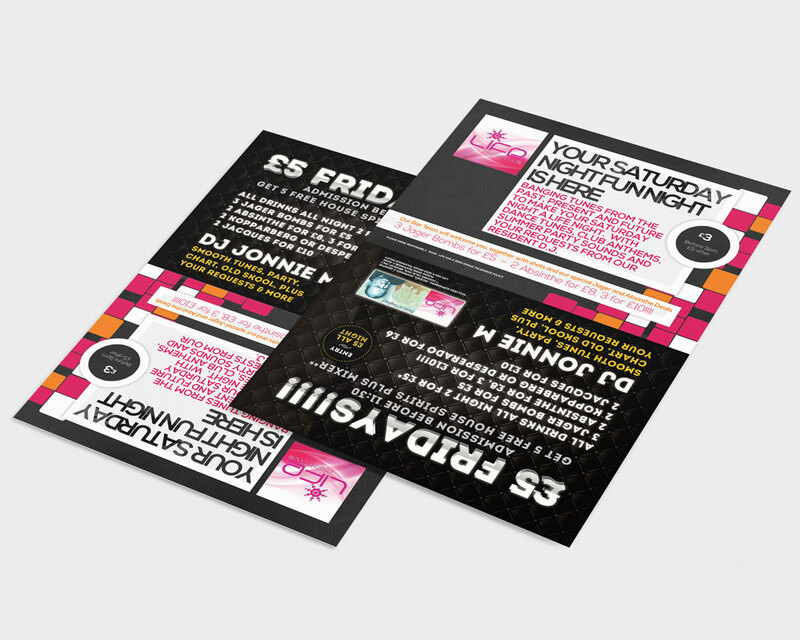 We had designs on giving Sittingbourne a great night out! Life Nightclub in Sittingbourne needed some new flyers and posters to promote the club with a new management team. The new management team decided to use Square Balloon on a trial basis for their Christmas Flyer. 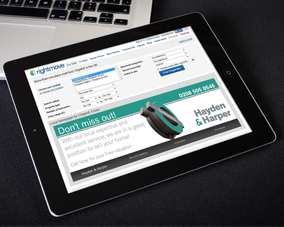 The management team at Life were really happy with our work and decided to use us as a preferred supplier. Soon after we designed two new flyers to promote their club. A duplex flyer that had information for both Friday and Saturday on one flyer. 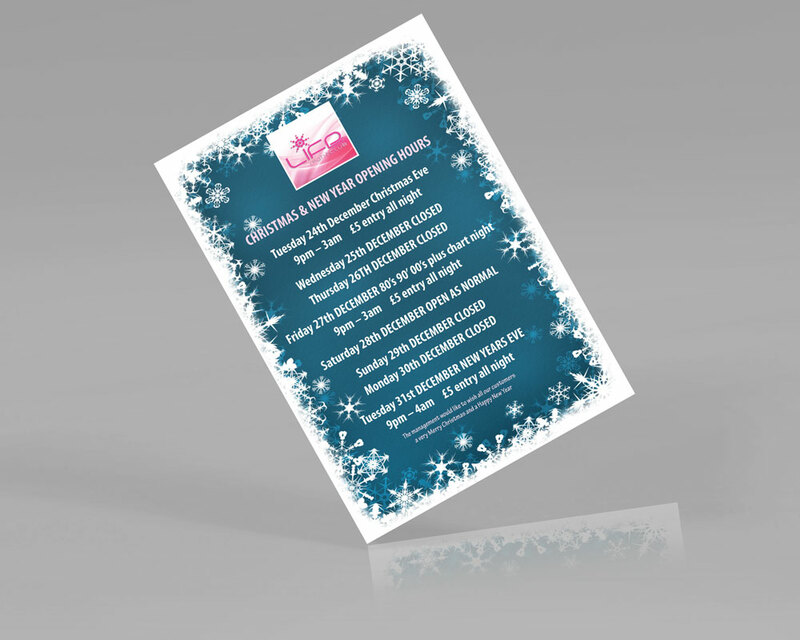 The flyer could be turned upside down and reused saving Life money on printing costs. 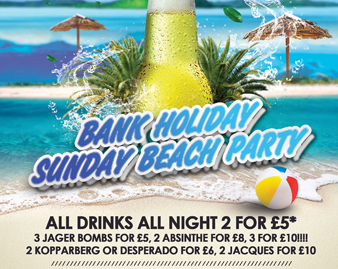 The second flyer was a Summer Beach Party flyer. Having completed the flyers satisfactorily we went on to design matching Facebook covers as part of a package deal we had with them. Life also decided to use us to design some beer mats with advertising featured on them. Satisfied with our work, they tasked us with finding a solution to a problem. They had monitors based around the nightclub and wanted to use them for promotional purposes. 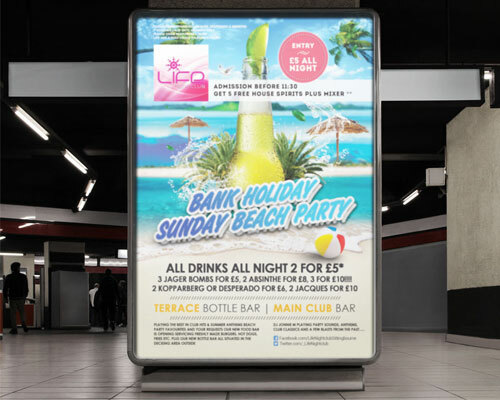 We designed a slideshow based solution with an advert that kept the clubbers happy. When working with Life we discovered that they had no access to their logo. We were tasked with recreating the logo from scratch to match existing literature and the sign outside the club. 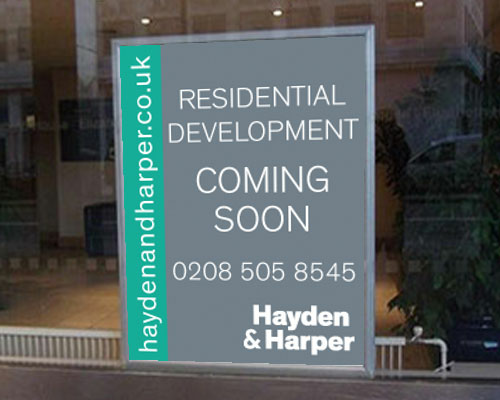 Managing Director, Haydn says... Thanks very much for these posters I absolutely love them. The designs you have come up with are really unique and exactly what we wanted, in particular finding a way to include all of the information that we asked for. It was an additional bonus to have the social media cover pages, and was refreshing that you offered this service to us. Illuminate Electrical Solutions were a great company to work for. The owner Dave had just started his new business, although had been in the industry for years. The great thing about Dave was his passion to have a modern company, and his understanding of how important a good brand was to that. First he tasked us with purchasing his domain name, so that he could have his own email addresses. Soon after that he put us into action designing his full brand and identity. From the brief it was clear that Dave had ideas on growing big, and this brand and identity had to represent the company as it grew and changed. Illuminate Electrical Solutions were possibly going to end up specialising in smart homes, so we had to take that into account. Dave didn't want to limit himself however, and wanted to ensure that the logo was transferrable if he started to use other trades. We came up with some sketches of logos for Dave, and luckily he fell in love with one of our ideas. 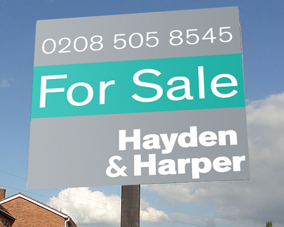 After polishing off the logo in our specialist software, Dave asked us to design some business cards for him. Dave was excited with our innovative approach when we suggested UV printed business cards. The UV cards stood out from the crowd, and gave an electrical reflective feel. After the business cards, Illuminate Electrical Solutions decided to use the design on their van, and we were only too happy to help. Owner, David says... I really enjoyed working with Square Balloon. I really wanted an input into the design so that I could feel like it was mine, and Square Balloon really brought me into the process. I suggested some ideas, and then we went back and forth until I had a design I loved. Then they made an electronic version and gave it to me so I could put it on my van.